Here's one piece of swag I won't be donating to a charity. 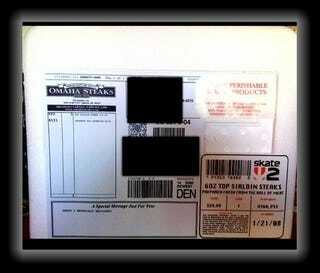 Electronic Arts sent me a freezer box this morning packed with Skate 2 assets and two frozen steaks. I'm pretty sure I won't be storing that in my closet until November. But what's this about the two 6 ounce steaks being "prepared fresh from the Hall of Meat"? It's people. Skate 2 is made out of people!